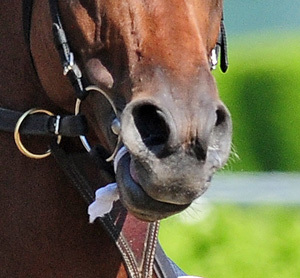 Horses and Their Tongues: What's up with that? After such good, but heavy conversation in my recent posts, I thought it would be fun to take a look at a lighter side of race horses. This includes a new angle for betting I have stumbled upon for the Belmont and my prediction of who could win. While touring the awesome stallions at Lane's End Farm, my buddy Aragorn stood out from the crowd with a talent I had not witnessed in person. His tongue was merrily wrapping up and around his handler's arm. That tongue was talented, and it was quite humorous. These things made me wonder what is up with horses and their tongues? Evan suggested one idea. His wife trains Thoroughbred horses for three-day eventing, and she has spoken of horses licking their lips. She said there are horses who lick their lips as a sign of processing. So a horse licking their lips is a sign of thinking and learning, not that horses who don't lick their lips aren't. In eventing, horses have much more to learn, compared to racing, with various commands, techniques, and habits. A new Triple Crown angle, that's what's up with their tongues. The Belmont. Yes, the Belmont. I have learned through my co-worker Amidala, at least two past Belmont winners are horses who like their tongues being pulled. Victory Gallop, formerly at WinStar, likes his tongue to be pulled. Victory Gallop denied Real Quiet the Triple Crown in 1998 on a photo finish. 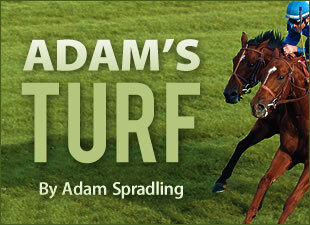 On top of that, his son Anak Nakal will be contending in this year's Belmont. We could also look at Empire Maker, as he will stick out his tongue for you to pull. 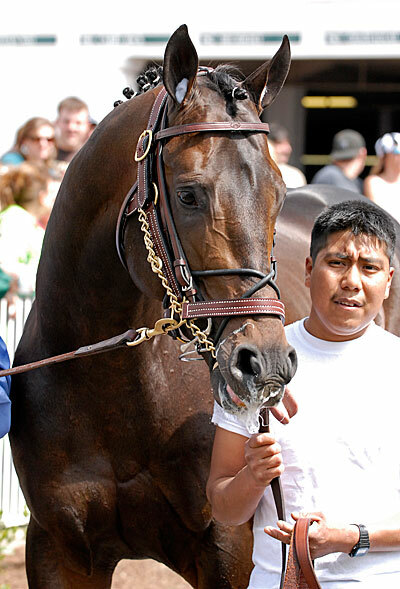 Empire Maker denied Funny Cide the 2003 Triple Crown. Is it genetics that plays a role, as in this son of Unbridled? Unbridled enjoyed having his tongue pulled. If that is the case, you might want to take a very close look at Anak Nakal! Let me explain it like this: If Empire Maker and Unbridled both like their tongues being pulled, and Empire Maker is a son of Unbridled. Then if Victory Gallop won the Belmont and enjoys a good tongue pull, then Anak Nakal is destined to lick the field, right? I think we need to discover if Anak Nakal enjoys having his tongue pulled...if so, this angle just might work. Here is a recent article on Anak Nakal from BH.com. Tough-guy Tom Hall made a good point on tongue ties. 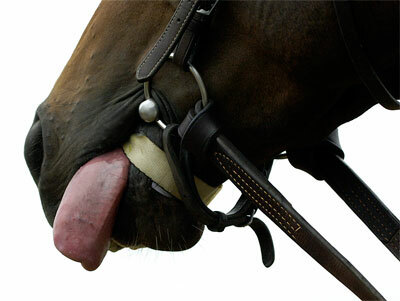 Would you start a collection of famous horses' tongue ties? Marta laughed and said she would not, due to the excessive slobber on the ties. Then a discussion followed describing the different materials and objects they have heard of being used for tongue ties and how you can find a nice variety laying on or around the track if you look. I seemed to have pictured an event like searching for seashells on a beach. Anyway, If you all demand it, there are other talent angles to choose from such as Summer Squall who enjoyed lifting the foreleg for a peppermint (courtesy of Suzanne) or horses who enjoy having their gums rubbed. I also enjoyed the peanut-butter on Mr. Ed's gums to make him "talk." Well Scoop Novak helped me to track down a direct source of Anak Nakal. 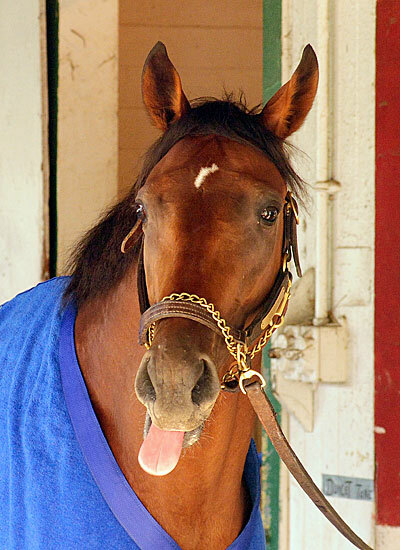 Apparently Anak Nakal does not like his tongue to be pulled, that dosn't mean he won't play with his tongue, but, this very well could throw out my theory of the tongue angle in the Belmont. Or could it? I am not sure if all the answers we need can be taken from this pretty simple statement. Our source stated, "We don't really mess with our horses after they're done galloping; we pout them up in teir stalls and leave them be." Then Scoop asked, "Does Anak Nakal enjoy tongue action?" and the source answered, "Never. He'll bite you, that's what he'll do." There has been some discussion of tongue ties and the previous picture. Here is a "hot off the press" look at Big Brown's personal tongue tie.